There were at least 7,662 spills, blowouts, leaks and other mishaps in 2013 in 15 top states for onshore oil and gas activity, according to an EnergyWire analysis of state records. That's up from 6,546 in the states where comparisons could be made (EnergyWire, July 8, 2013). Many of the spills were small. But their combined volume totaled more than 26 million gallons of oil, hydraulic fracturing fluid, "fracking" wastewater and other substances. That's the same volume as what gushed four years ago from BP PLC's ruptured Gulf of Mexico oil well in 11 days. Source: News Research Note: The above information counts the raw number of spills in the states that made information available online, or specifically to EnergyWire. It does not include spills in Louisiana and Pennsylvania. It does not account for volume or the scale of a company's operations. One of the biggest spills of the year flowed from Montana into North Dakota, but it wasn't in the Bakken. It was farther south, at a Denbury Resources Inc. enhanced oil recovery near the state line. Three days before Thanksgiving last year, a pipeline carrying production wastewater broke, and more than 700,000 gallons of wastewater leaked into the ground. The brine surfaced and flowed into a dry Badlands drainage called Big Gumbo Creek, polluting nearly 3 miles. "We still have this mentality that we have to go faster and faster," said Don Morrison of the Dakota Resource Council, an environmental group that monitors activity in the Bakken. "When you're rushing, things go wrong." Reported spills from oil and gas well sites, according to publicly available state and federal data. Map by Andrew Holmes. The oil and gas companies say that they're working hard to reduce spills and that some of the increase in spill numbers comes from more diligent reporting. "I think we're getting closer to 100 percent reporting," said Kari Cutting, vice president of the North Dakota Petroleum Council. "Everybody is very conscious of the situation. Nobody wants spills." Activity was higher than the rig count would indicate, Cutting added, because rigs have become more efficient. State officials say they measure activity by the number of wells. Records show the number of new wells added in North Dakota last year was up 11 percent, still lagging behind the spill rate. Pennsylvania had a 60 percent increase in spills, paired with a 30 percent decrease in rig activity. But industry and state officials say the increase is attributable to a lower spill reporting threshold in place for the last three months of the year. There is no national list of spills from oil and gas production. The Bureau of Land Management keeps reports about "undesirable events" on federal lands, but other spills are handled state by state. EnergyWire assembled the data from the websites and files of state environmental protection departments and oil and gas agencies. 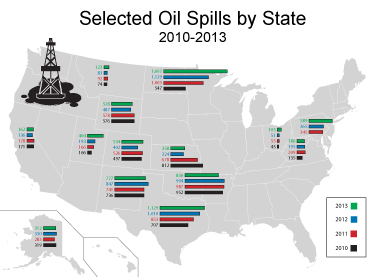 Just looking at the numbers, Utah appears to have had a huge jump in oil spills last year. But a closer look indicates something else. The number of incidents at oil and gas sites there doubled to a little more than 400 in 2013. But 150 of those were reports of flaring at Kinder Morgan's Altamont gathering facility. Kinder Morgan bought the facility in 2012 and has been reporting more flaring. Jim Springer, spokesman for the Utah Division of Oil, Gas and Mining, said many of the reports were not required under state regulations. The company "reports everything to us even though it is not required by our regulations," Springer said. "So, it appears to be a big spike, but most of that is not reportable by our policy." Such anomalies are part of the difficulties in getting a firm number for the spills and other mishaps that occur at oil and gas sites. There is no national list or even a standardized way to report them. Each state reports spills differently, and some don't report them at all. Some states have the data freely available on their websites, some states charge for the information, some compile the data only in bulk, and some require public records requests. Louisiana and Pennsylvania officials said they had no list of spills. Pennsylvania could provide only a bulk figure without dates or company names. Louisiana officials said the information can be found in the database of the Coast Guard's National Response Center, but that database is shut down. A Freedom of Information Act request filed March 21 remains unfilled. Enforcement data are even more difficult to get. Some oil and gas agencies, such as the North Dakota Department of Mineral Resources, don't even compile enforcement data. Enforcement actions are kept in the individual well files. Spill reports in Pennsylvania jumped 61 percent, but state officials say much of the increase came because of new rules setting a lower threshold for reporting spills that took effect in September. "The policy encouraged operators to report all spills," said Pennsylvania Department of Environmental Protection spokeswoman Morgan Wagner. "Thus, the department is receiving many more reported spills. The department is confident that no other state has such a low reporting threshold." Since Pennsylvania officials don't provide data on spills beyond a raw number for the calendar year, there is no way to assess whether companies are reporting smaller amounts or just having more spills. But people who follow shale drilling issues in Pennsylvania find it odd that rules enacted in September would drive such large change. "So that big ramp-up in 2013 all happened in the final three months of the year as a result of this new policy?" asked John Amos, president of the environmental research group Skytruth. "What are all of these new spills that are being reported, that were apparently happening all along?" Pennsylvania's new threshold is 5 gallons. North Dakota's threshold is 1 barrel, or 42 gallons. Companies that drill there have said that counts of raw spill numbers can make them look worse because the state requires reporting of smaller spills. In Texas, the threshold is 5 barrels. And in Oklahoma and Montana, it's 10 barrels. There's also disagreement on how to measure industry activity. The Baker Hughes Rig Count has long been the standard measure. It was down last year in many states, including North Dakota and Pennsylvania. But the number of new wells increased 11 percent from 2012 to 2013. The North Dakota Department of Mineral Resources, which oversees drilling in the state, said the state measures activity by the number of producing wells, said spokeswoman Alison Ritter. Ramona Hovey of the research firm Drillinginfo, who wrote a recent article called "Are Rig Counts Dead?" suggested that the count of "spuds," or holes drilled, might be the best measure. The spud count went up 8 percent last year in North Dakota. In terms of spills, Ritter said that what matters most is whether they are contained to the well site. But that can be murky as well. More than three-quarters of last year's spills were contained to the well site, similar to the year before. But the volume released in the uncontained spills was much larger. In 2012 the amount released in uncontained spills was a little more than 9,000 barrels. In 2013, it was more than 50,000 barrels. A big chunk of that appears to have been from two spills, listed as 18,000 and 8,000 barrels of "other." The four biggest uncontained spills were all "fresh water," Ritter said, rather than water contaminated by underground formations. And there was one event, a 17,000-barrel pipeline spill in North Dakota's southwest corner. The number and volume of spills is an undercount, as some states don't make data available. It also excludes spills from offshore wells and large interstate pipelines, which are handled by federal officials. There were also sharp increases in Ohio, where drillers in search of oil and natural gas liquids are moving into the Utica Shale, and Colorado, where floods tore through oil and gas sites in September. Production-related spills in Ohio doubled, records show, from 51 to 103. But the total number of spills is still small compared with its neighbors, and Ohio is bulking up its enforcement efforts in response to the increased activity, said Mark Bruce, spokesman for the Ohio Department of Natural Resources. Since 2010, Bruce said, the agency has tripled the number of employees dealing with oil and gas to more than 100. That includes 50 inspectors, and the state is working to hire 15 more. "ODNR will continue to do all that we can to prevent incidents and will respond quickly and effectively, with our appropriate partners, when they do happen," Bruce said. In Colorado, where state oil and gas officials are under fire from critics trying to ban fracking, inspectors issued 50 percent more "notices of alleged violations" than in 2013. In Texas, the oil and gas regulators at the Texas Railroad Commission have also been under pressure to step up enforcement. The agency issued one-third more "severances" -- threats to shut down wells for noncompliance -- than in 2012. An agency spokeswoman, though, said most of the increase was from delinquent organization reports and production reports. And the number of enforcement penalties assessed dropped 40 percent. In other states, the increase in spills didn't trigger an increase in enforcement. Wyoming had an 8 percent increase in spills, but the Wyoming Oil and Gas Conservation Commission said it issued no fines related to spills in 2013. In Pennsylvania, inspectors found about half as many violations, and the fines levied dropped 22 percent from $420,000 to $326,000. And inspectors in New Mexico's Oil Conservation Division haven't pursued fines against operators in years (EnergyWire, Nov 14, 2013). North Dakota officials say they don't have enforcement figures. Enforcement reports are kept in individual well files and not compiled. The reports highlight the variety of ways that spills can happen. Colorado had floods sweep across well sites in September. Montana's wells were hit by a number of tornadoes. One north of Billings in June hurled large steel tanks nearly a mile from a well site. Among the few states that record causes, the most common are equipment failure, corrosion and human error. But at least 40 reports last year cited frozen valves or other cold weather problems as the cause. More than 20 pointed the blame at cattle. Some spills come with explosions and injuries. At a Newfield Production site in Utah last May, three workers were tying a new water tank into the tank battery when a series of explosions occurred. One of the workers, the pumper, was pinned under a tank, fracturing his sternum. About 500 barrels of produced water and oil soaked into the ground. The largest spill was a 66,000-barrel (2.8 million-gallon) release of coalbed-methane-produced water from a WPX Energy site in Wyoming's Powder River Basin. The water produced from shallow coalbed methane formations in that area can be clean enough for humans to drink, but the salt content can turn farmland hard as concrete. The company's predecessor, Williams Production RMT, paid an $18,000 penalty to the Department of Environmental Quality for a series of improper production water discharges in the Powder River Basin in 2010. In Montana, the biggest operator and biggest spiller is Denbury Resources, which doesn't work in the Bakken. The company's focus is enhanced recovery in the Cedar Creek Field in the state's southeast corner. The company accounted for 87 percent of the 123 spills of oil and gas production spills reported to Montana's Department of Environmental Quality. In North Dakota's Bakken, much of the increase in spills came from smaller, newer companies that hadn't had a large footprint in the Bakken, such as Halcon Resources Corp., which had 67 spills, all in the second half of the year. EOG Resources and Exxon Mobil subsidiary XTO Energy also had big increases in the number of spills. EOG spokeswoman K Leonard said spill prevention is a "constant focus" for the company. "In 2014 we are introducing an enhanced spill reduction program in North Dakota designed to provide additional training to employees and contractors working across the state to improve our liquids-handling processes," Leonard said. The largest operator in the Bakken is Continental Resources Inc., which also had the most spills. The number rose by about 8 percent last year. But Continental executive Tom Oddie said that lagged far behind a 39 percent increase in production. "Spills were nearly flat from 2012 to 2013, despite increased production," said Oddie, vice president of health, safety, security and environment for the Oklahoma City-based operator. Oddie said Continental is actively working to reduce spills and their impact, maintaining "spill prevention teams" and taking "appropriate action" against contractors that fail to improve their performance. The company installs steel-lined containment systems and emergency shutdown systems at many of its well sites. "All these enhancements are part of our drive to continuously improve," Oddie said. Click here to read EnergyWire's previous reporting on oil and gas spills. Correction: The story and headline have been changed to reflect the correct percent increase in spills from 2012 to 2013. In the original version, it was incorrectly listed as one percentage point higher.